Returning this fall to Oakland, CA is the projection design for Right to Be Believed with Flyaway Productions. 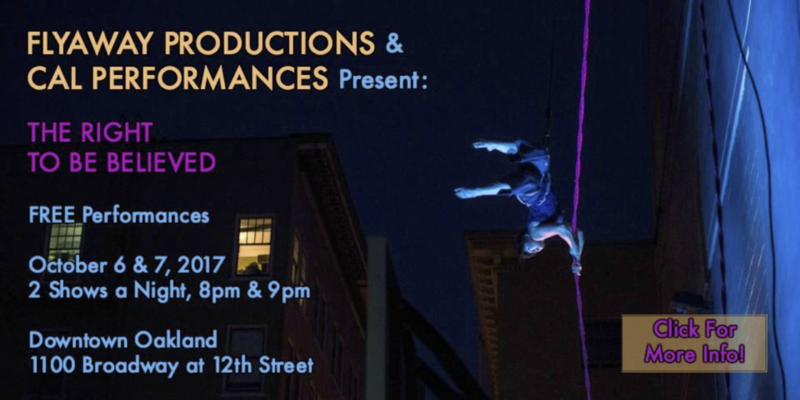 Flyaway Productions’ The Right To Be Believed is a free aerial dance performance exploring of the credibility of women’s voices in the public realm. Directed by Jo Kreiter and produced by Cal Performances. Taking place at night on the wall of the University of California, Office of the President the members of Flyway uses the gravity-defying art form of aerial dance—her performers navigating vertical urban landscapes with ropes and harnesses—to elevate female voices and call attention to the legal, social, and professional constraints that disempower women. 1100 Broadway at 12th St.